* Prices shown in ( )　indicate group (more than 20 persons) discount tickets. This is an exhibition which commemorates the 40th anniversary of the death of Bernard Leach (1887-1979). Leach was fascinated by the profoundness of Japanese pottery. He developed close relationships with Soetsu Yanagi, Kanjiro Kawai and Shoji Hamada. Leach returned to England, accompanied by Hamada. 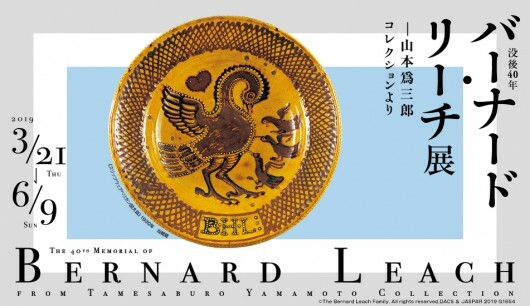 Even after that, Leach often came to Japan and visited potteries in Kyoto, Mashiko, and other areas. Improving traditional techniques to higher levels of maturity, he became one of the most famous potters in Modern pottery. Tamesaburo Yamamoto, the first president of Asahi Breweries, is known to have enthusiastically supported the Mingei Movement. This exhibition will showcase about 100 works all at once and displayed will be those relating to the Mikuni-so, the Leach Bar and valuable pieces representing Yamamoto’s close relationships with Yanagi and many other Mingei artists.